The flood zones bordering creeks and streams are called riparian areas. Cibolo Creek is a critical habitat for wildlife and an important source of recharge for the Edwards Aquifer. The creek is tested regularly for water quality and is part of the Texas Stream Team monitoring program. The Cibolo Nature Center’s riparian area is mostly composed of trees and woody plants, including bald cypress, sycamores, walnuts, and many other woody species. 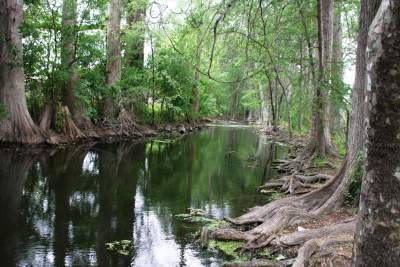 The towering cypress trees along Cibolo Creek create a canopy of life overhead. Birds flit about, squirrels race from limb to limb, and raccoons, opossums, and ringtail cats sleep peacefully through the day in tree hollows. A walk along Cibolo Creek might reveal sycamore leafed snowbells, spice bush, big-red sage, Virginia creeper and a multitude of other forbs. If you are quiet, you might get to see red-eared slider turtles sunning on a fallen cypress tree or a Guadalupe bass swimming in the pools. Birds flutter in the trees and there may even be a barred owl silently watching you from above while great blue herons and egrets hunt for fish in the shallows. You may even encounter a water snake, but have no fear. That's either a diamond back water snake or a blotched water snake, neither of which are venomous. The nature center maintains the health of the riparian area by removing garbage and eradicating invasive plants. We welcome all the help we can get to keep the creek clean. However, brush and branches deposited by floods are left in the creek to provide shelter for wildlife and help to slow the flow of water during floods.